ACDelco Dex-Cool® Anti Freeze / Coolant is a universal long life engine coolant. It is a nitrite-, nitrate-, phosphate-, silicate-, borate and amine-free formulation which uses a patented carboxylate inhibitor technology to provide protection of the six basic metal alloys found in most heat transfer systems. 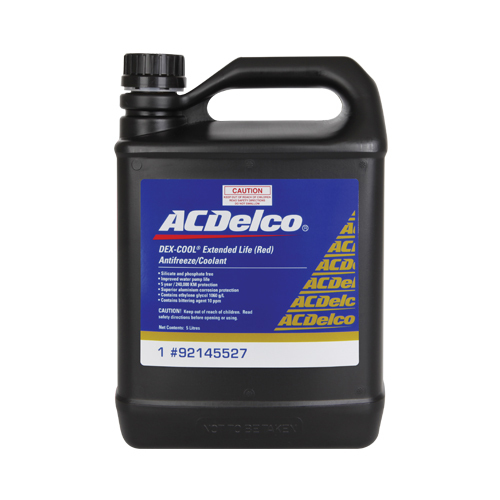 ACDelco Dex-Cool® is an extended life automotive engine coolant and anti-freeze providing up to 5 years protection. Provides effective, long term corrosion protection for aluminum, brass, cast iron, steel, solder and copper. Protects against winter freeze up and minimises the chance of summer boil over. Outstanding hot surface aluminum protection. 5 year or 240,000 km recommended service interval when complete flush and fill is performed. Compatible with water pump seal materials and minimises the formation of abrasive dissolved solids. Biodegradable in its pure unused form. Nitrite, borate, phosphate, nitrate, and amine free. Provides protection in high operating temperatures.